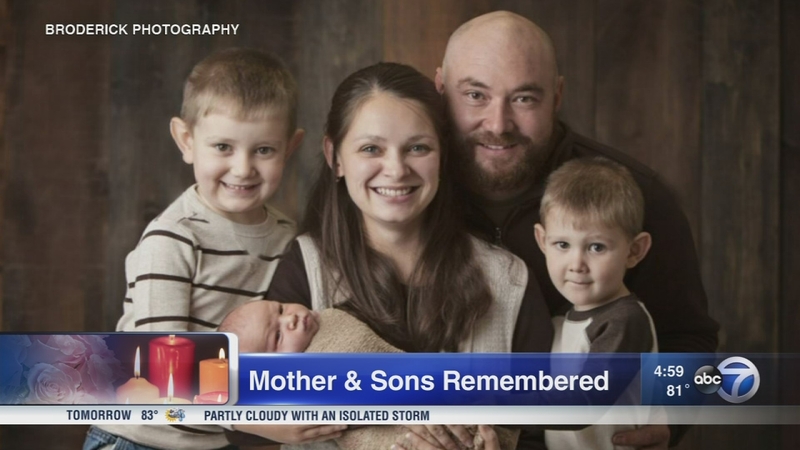 BEECHER, Ill. -- A traffic citation issued to the driver involved in a crash in Beecher, Ill., that led to the deaths of a pregnant mother and her three sons was dismissed Tuesday, authorities said. The Daily Southtown reports the 25-year-old driver might still face charges in last week's crash. Officials said even though the citation has been dropped, it can be re-issued at a later date. Funeral services were held on Wednesday at Trinity Lutheran Church in Crete for 29-year-old Lindsey Schmidt, 6-year-old Owen, 4-year-old Weston and 19-month-old Kaleb. Throughout the service, which lasted about 50 minutes, the Rev. Frank Italiano stressed Schmidt's Christian faith and her involvement with the church. The Will County sheriff's office said Schmidt and her three boys were on their way to bible classes at Trinity on July 24 when a pickup truck blew a stop sign and struck their sport utility vehicle. Schmidt and her youngest son Kaleb were pronounced dead at the scene. Weston died at Comer Children's Hospital at the University of Chicago the following evening. Owen succumbed to his injuries two days later. Will County State's Attorney James Glasgow said the case remains under investigation. A fund for the Schmidt family has been set up at First Community Bank and Trust. CLICK HERE to make a donation on the "Online Giving" page of Trinity Lutheran Church's website.